After a 14 years´ break, Scottish rockers Gun will release their great return on June 15. The band´s debut album, “Taking On The World”, achieved multiple successful singles, appearances and guest slots with acts such as The Rolling Stones, Bon Jovi, Simple Minds, Bryan Adams or Def Leppard. With critically acclaimed albums, singles, many awards and a few line-up changes under their belt, Gun decided to call it a day in 1998. Fast forward 10 years into 2008, Gun was awarded with the prestigious Nordoff Robbins Tartan Clef award for 'Scotland's Best Live Band', which ultimately led to the band´s reunion, accompanied by an enthusiastic response. 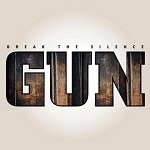 Break The Silence was produced by Dave Eringa, mastermind behind artists such as The Manic Street Preachers and Ocean Colour Scene. The collaboration resulted in a perfect balance between a modern approach and a vintage Energy, flirting with the times of The Stooges or early Stones. The perfect sonic dress for Gun´s inspired and versatile songwriting. Not just another exercise in nostalgia, but an album that “had to be made”, featuring songs that were too good not to be heard. Gun fans will certainly agree it was worth the wait: the eleven songs forming the new album remind of some of the greatest rock albums. No fillers, power, energy, refined and rough at the same time. GUN is: Dante Gizzi - vocals/bass guitar, Jools Gizzi – Guitar, Johnny McGlynn - Guitar, Paul McManus - Drums. Tracklist: 01. Butcher Man 02. 14 Stations 03. Lost & Found 04. Caught In The Middle 05. 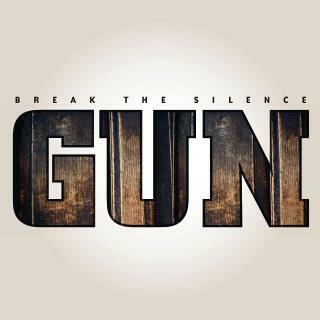 Break The Silence 06. How Many Roads 07. No Substitute 08. Bad Things 09. Innocent Thieves 10. Running Out Of Time 11. Last Train. Heard some of the songs on the radio and seen some live performances of the songs on Youtube. Sound like little more than a pub band live now. Not good. Vocals are really poor and the songs don't sound like GUN at all. Very disappointed. Hey man just got to laugh at your comments on the the new gun album which you haven't heard in its entirety but the funniest thing you said was that they are little more than a pub band,think you may not have liked the band at all or you would give your name and be a bit more constructive in your opinion Get a grip dude!